Modal made a name for themselves a few years back with the release of the 002 hybrid poly synth, which is absolutely an amazing instrument for anyone lucky enough to own one, but priced out of reach of many musicians. 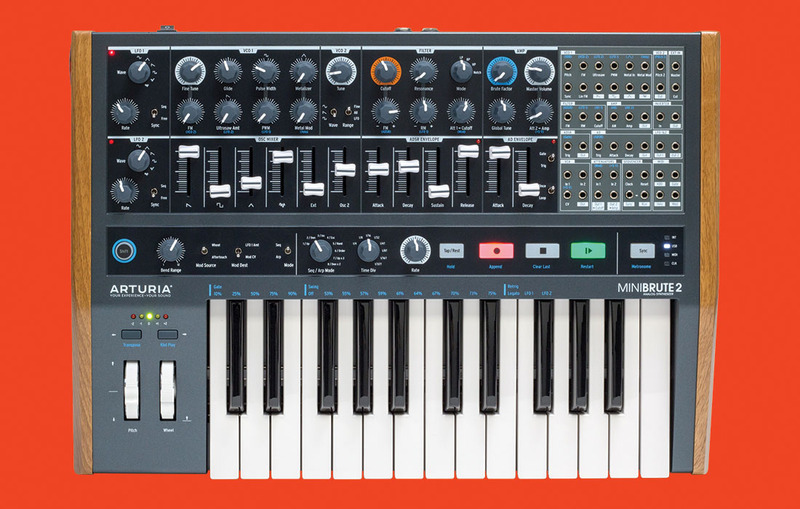 In July 2018, Modal announced a Kickstarter campaign for a very different type of poly synth, but one that shares the same character as their venerable 002. And after a very successful campaign, we now have SKULPT, a very portable, and very affordable digital poly synth weighing less than 1kg and can be powered either via USB or batteries. It has an interesting design with a lid that can also be used to make the unit sit flat on a desk. Without the lid the back is propped up by the battery compartment so it sits at an angle which can really help with visibility depending on how your sitting relative to your desk. On the back of the unit we have full size MIDI in and out ports, sync in and out, as well as both headphone and line outputs. The fact that SKULPT has a little keyboard attached is great given that it’s a very portable instrument, and it’s a very sensitive playable keyboard should you find yourself somewhere unusual like a bus or a plane, but for more nimble playing you are probably going to want to put those full size MIDI ports to use and plug in a controller. 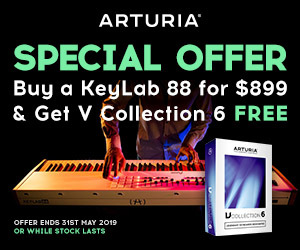 In our demo we used the Arturia Keylab Essential which has full size velocity sensitive keys, although the SKULPT will also respond to aftertouch provided your controller is capable of transmitting it. To be clear, the SKULPT is entirely digital, unlike Modal’s previous instruments, but that’s not to say it doesn’t sound analog (because it certainly does), and that’s as well as some great and more blatantly digital sounding FM capabilities. And at under $600 here in Australia, what you’re getting for the money is pretty amazing. 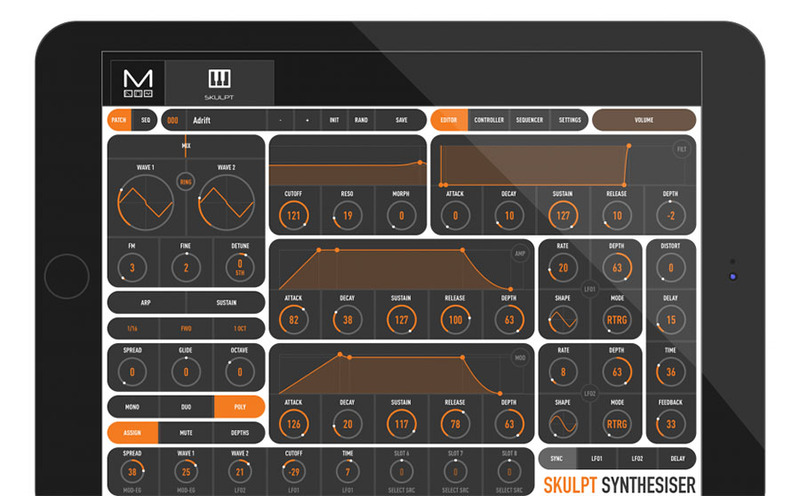 SKULPT is a 32 oscillator synth. With a maximum of four voices, that’s 8 oscillators per voice. 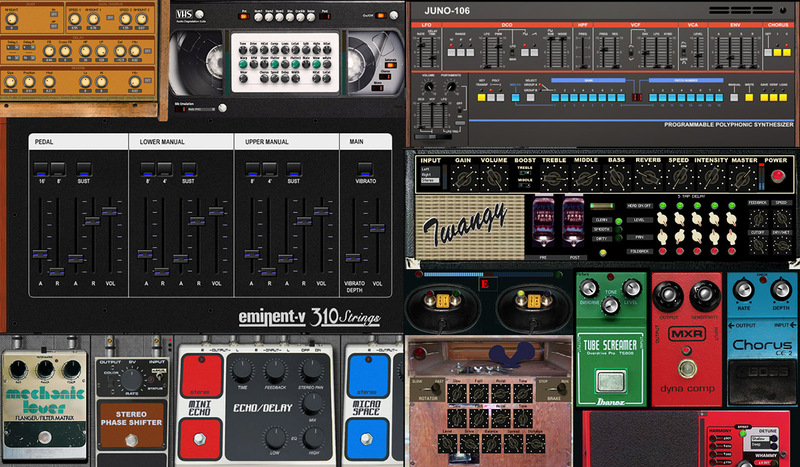 Plus you can also chain up to four units together for a total of 16 voices and 128 oscillators. Taking a look at the front panel, you can see there’s a lot crammed in which can be a little daunting, especially considering each knob and button has a secondary function when used in conjunction with the shift button. 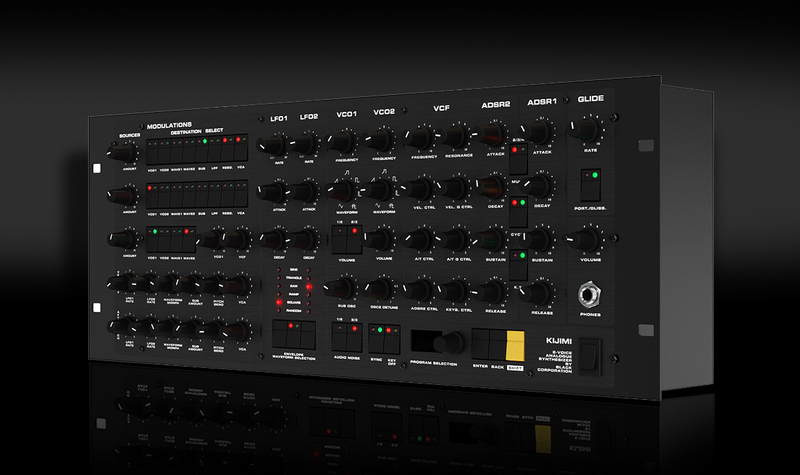 But once you wrap you head around it, you’ll start to understand just how powerful this synth is. And to help ease you into it, a free software editor is available which runs on Mac, PC, iOS or Android. In the top left of the editor we see that the 32 oscillators are divided into two banks of 16, and all the oscillators in each bank share the same waveform. Wave 1 is the waveform for the first bank of 16 oscillators, and wave 2 is the second bank. But instead of being restricted to several preset waveforms, each wave is freely morphable. Wave 1 goes from a sine wave, through a triangle wave, through a sawtooth wave, into a pulse wave with variable width. Wave 2 starts a similar way but ends up with filtered noise. Then we can mix the two waves together, and it automatically maintains a consistent volume no matter where the mix control is set. We can also get some great FM sounds by using Wave 2 to modulate Wave 1. And even add ring modulation to make things even more hectic. Wave 2 is freely tunable either in cents or in intervals which dramatically alters the effects of frequency modulation and ring modulation. Then we have the voices section which is where we decide how the 32 oscillators arranged. In poly mode, we can play up to 4 notes with 8 oscillators per note. And by default they’re all perfectly in tune, but the spread parameter lets us detune them all simultaneously. Once we get to the 50% mark, the voices get tuned to specific intervals which can be either chords or octaves, including an octave above and one below, effectively acting as sub oscillators. In Duo mode, we’re restricted to playing two notes at a time, however each note is using 16 oscillators, and mono mode, all 32 oscillators are stacked in unison. And no matter which voice mode you’re in, the spread parameter works the same. Next we have the filter, which, like the oscillator waveforms, is freely morphable. So instead of having to choose between a low pass filter, or a high pass filter or a band pass filter and so on, we can morph between these modes. So we can create unusual curves that may have a very soft slope and also take a slice out of the top end, and a wide Q around the cutoff frequency. The filter sounds really rich and analog. With lots of resonance, it really brings out the harmonic series in the oscillator waveform. Moving down the software interface we can see the modulation section where we can have up to 8 simultaneous modulation assignments. Each slot can be one of 8 modulation sources and there are 37 possible destinations. So each of these assignments can be completely unique, or you can have one modulation source modulating 8 different parameters, or you can modulate one parameter with 8 different sources. Or anything you like really, you just can’t have more than one of the exact same assignment e.g. LFO 1 to Global Tune. SKULPT has two LFOs which can both go up into audio rate and have morphable waveforms which sweep from sine wave to sample and hold. LFO 1’s rate goes from very slow to just into audio rate. LFO 2 has the same morphable waveform, but once the rate gets to the 50% mark, we can choose its speed in relation to the frequency of the current note being played, so either divisions of, or multiples of. Then we have the effects section which consists of both a distortion and a delay. The distortion is nice and aggressive but still musical and not overpowering. And the delay has three parameter, that being amount, time and feedback. 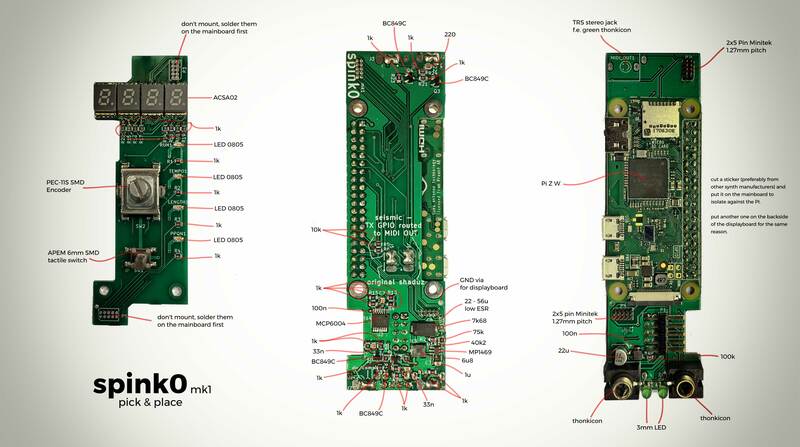 Finally we have the sequencer which is a real time recorder, not a step sequencer. It is probably most useful to think of this sequencer as more of a performance looper and you can automate up to four parameters. This functionality is referred to here as parameter animation. You can of course always sequence the SKULPT from a computer via USB, or a hardware sequencer like the Arturia Beatstep or Korg SQ-1 via MIDI. But real-time recording on the SKULPT is a lot of fun with a maximum length of 4 bars. You can in fact record the output of the arpeggiator and there’s also a looping function where you can choose to loop just a section of the recording. After recording an arpeggiated part you can disable the arpeggiator and jam over the top. All in all, this is an incredibly powerful unit and astonishingly good value. 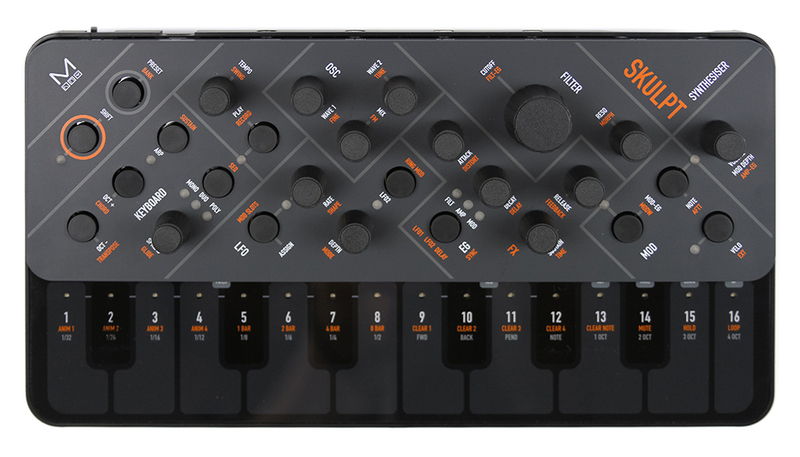 It’s a crowded marketplace of small portable synths at the moment, but the SKULPT bring an enormous feature set — one that gives the bigger manufacturers a large, 32 oscillator-powered challenge. Check out the SKULPT on the Modal website here. 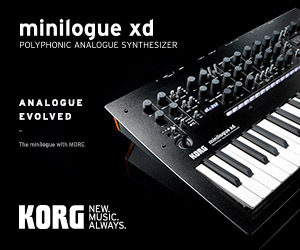 Or better yet, go and try one at your local reputable synth retailer.